If you’re looking for a rugged, reasonably priced, feature packed sliding compound miter saw with near legendary performance and tremendous flexibility, capable of tackling a wide range of projects, and designed to make your jobs faster, easier, and safer, the Bosch 5312 Dual Bevel Sliding Compound Miter Saw deserves to be at the top of your list. 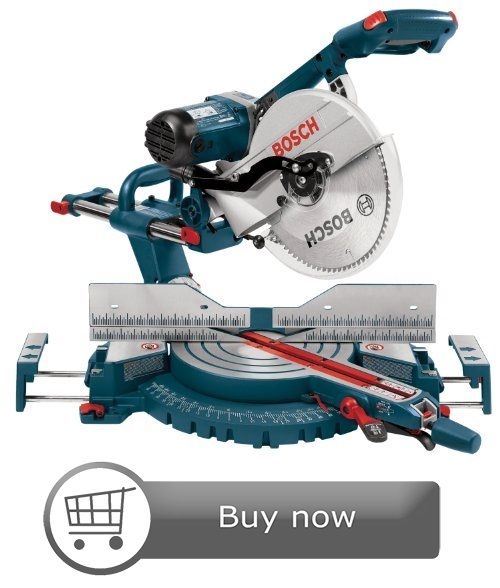 2 See The Bosch 5312 Slide Compound Miter Saw In Action! 4 Sounds Great, But What Are The Cons? Features such as the Up-Front Bevel Lock Lever and Range Selector Knob make your work faster by keeping the controls to tilt the power-head within easy reach for quick, accurate bevel settings minus the hassle of “reaching.” Especially handy for those jobs that require changing angles for every cut. This is a big saw with a 15-amp motor to power through the toughest cuts, and a Large 25-1/2″ Base for stability with sturdy Built-In Cast Sliding Extensions giving a total length of 40″ of support. The Tall 4-1/2″ Speed-Track Sliding Fences are very solid, increase the saw’s cutting capacity for crown molding and make for easy bevel set-ups. “Rugged” is a term tossed around a lot by power tool manufacturers, but this saw really deserves the designation. Users around the Internet talk about dropping the saw multiple times on a job, and even getting it wet, with no problems except some cracks in the plastic that did not effect functionality. Additionally, users stated that they did not even have to recalibrate the saw after it fell. Yes, a single bevel will work, but let’s say you’re putting up crown molding… If you’re a beginner, those odd miter and bevel angles (31.6°? 33.9°? huh?) are confusing enough without having to turn the work upside down in the saw to match corner angles. A dual bevel miter saw allows you to just turn the powerhead to the opposite matching bevel angle and keep the workpiece right-side up, which is much less confusing. Obviously, a professional benefits from the speed of simply adjusting the saw instead of constantly repositioning (flipping) the workpieces. Also, since the bottom of the molding is usually where you mark the wall length, it’s easier to see that when the piece is right-side up. The large, clearly marked, bevel and miter scales make adjusting bevel and miter angles a snap. 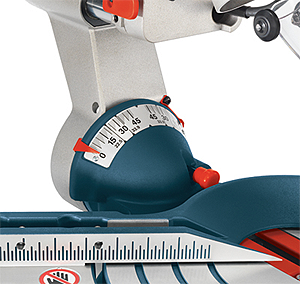 The angle detents are accurate, and the 5312 uses Bosch’s exclusive Wedge Slot Miter Detent System for consistent, precise miter angles, which combines with a design of dual sliding rail to provide accuracy for long term. Users praise the Miter Detent Override which allows custom precision angles to match the not-quite-90-degree real world conditions found on the job. Detent angles include 31.6° miter and 33.9° bevel settings for crown molding. Miter detents are set at many degrees on both left and right, and only 60 degrees on the right. Bevel detents are at the 0, 33.9, and 45 degree marks both left and right. The Electric Brake feature on the Bosch 5312 Dual Bevel Sliding Compound Miter Saw brings the blade to a stop quickly, making it both a safety and productivity feature. The faster the blade stops, the less chance for accidents and the quicker another cut can be lined up. A real time saver when doing many repetitive cuts. Most electric brakes use a reversal of electric current when the saw’s trigger is released to bring the blade to a stop, and can cut stopping time by over 80%. Base Molding – Against Fence: 4-1/4″ Max. See The Bosch 5312 Slide Compound Miter Saw In Action! how effectively placed the controls are, how well you can see the scales, and how smoothly it operates. Accessories (sold separately) for the saw include the DAF220K Miterfinder™ Digital Anglefinder with Leg Extension and Case which gives information needed to position cuts so that they fit together precisely even if the room is out of square, MS1221 Horizontal Quick Clamp Crown Stop Bracket which clamps work against the fence, can be used as a crown molding stop, and mounts to the left or right of the table, MS1222 Extra-long Base Rod Kit which consists of steel replacement rods that extend the total width of base to 60″, MS1223 Length Stop Kit which mounts to either side of the saw, MS1226 Replacement (Vertical) Quick Clamp, Bosch T3B TracRac™ Portable Miter Saw Stand With Wheels which folds down with saw attached and can be wheeled away, and the T4B Gravity-Rise Wheeled Miter Saw Stand which can be set up or taken down rapidly and wheeled away on 8″ wheels. NOTE: Various descriptions of these accessories do NOT list the 5312 among the saws they will fit, however, all of the accessories above are listed on page 37 of the 5312 owner’s manual as being appropriate for the saw. Sounds Great, But What Are The Cons? There were very few complaints about the 5312, and most of those were related to the saw’s size and weight, which were countered with the fact that it IS a 12-inch, dual bevel, sliding, compound, miter saw, and inherently large and heavy. The suggested solution to portability was a good stand, and for most people that stand was Bosch’s T4B Gravity-Rise Miter Saw Stand, which combined with the 5312 got rave reviews (the T4B also gets rave reviews all on its own). A minor weakness was the blade included with the saw (see above for details), which pleased some people, while others thought it wore out too quickly. It is designed for framing ⁄ trim carpenters, so to get the most out of the 5312 for other uses (woodworking) you will want to get a miter saw blade to match those jobs.